There was an impressive crystallized frost on everything today. In a few hours the ground was clear again. This is my vinyl "wicker" all-weather settee. 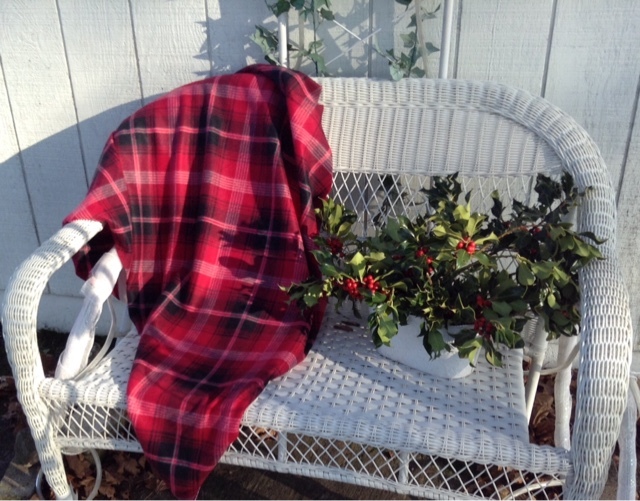 I plan to bring it inside when the temperatures get very cold, as it really isn't made for a freeze. It is part of my pretend "coach". 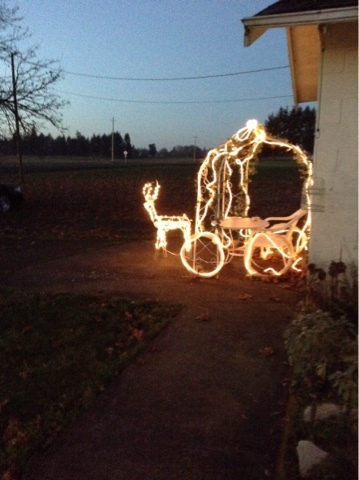 I got a cute wire reindeer, and though it is very lightweight and does not do well in the wind, it stayed upright long enough for me to get a photo of it supposedly pulling my "coach." 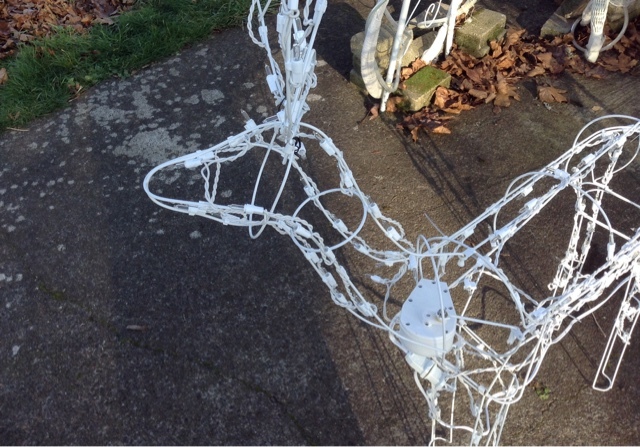 I didn't think the lighted wire deer looked very realistic, but a hunter dropped by to tell me it was deer season, and that I should keep an eye on it, in case someone tries to bag it. 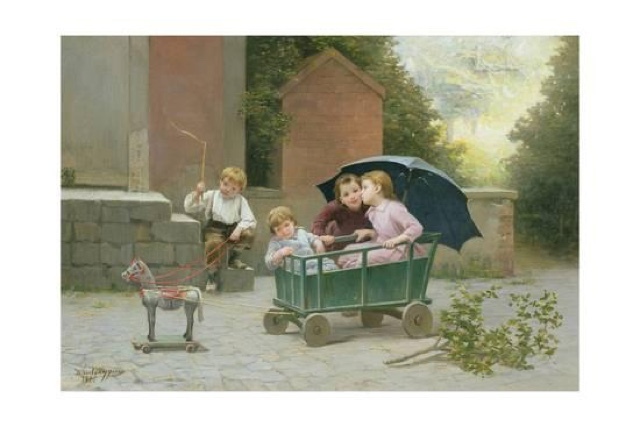 A lot has been transpiring around here and I have been very busy, and hope that tomorrow I will get a little time to drop by here and write some more. Your reindeer and coach look lovely - the magic of Christmas! 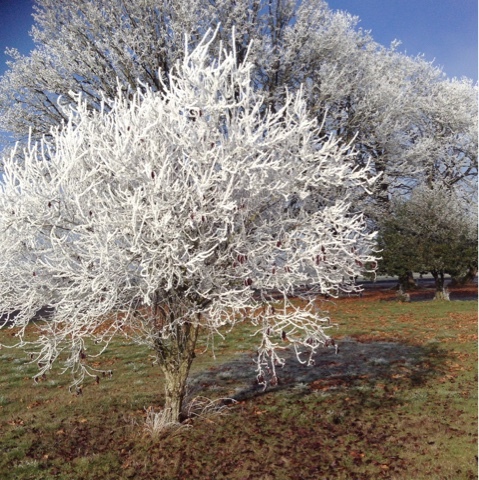 What stunning sights at your place with all the beautiful cover of frost....thanks for taking pictures of it all and posting them for us! I love the reindeer and coach,looks like inviting a ride to somewhere enchanting. Your trees are just beautiful with the frost. Hope you re experiencing some reflective time and relaxation. When my husband and I got married we went to Lake Tahoe for our honeymoon. We were driving over to Reno and the trees and bushes were all frosted with ice. There had been several ice storms over the pass. Everything was shimmering and sparkling not to mention very cold. It's been very warm and dry down here. My nose is all cracked on the inside and I've been drinking lots of liquids to stay hydrated. I love the reindeer. We used to have one when we had a front yard and our pointer had a fit over it. She did not like that lighted animal. 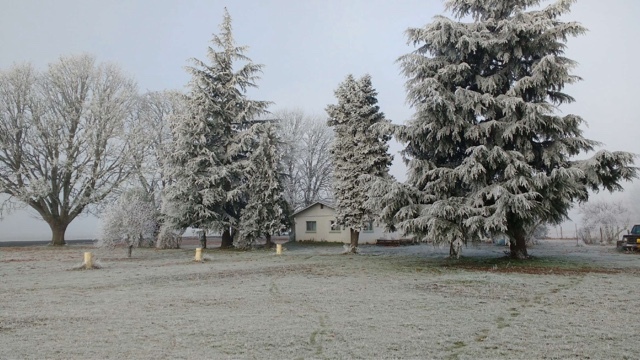 Beautiful frosted trees!! Cute deer coach you got there!! We haven't put our deer family up and I don't think we'll get to it this year. My in laws have the flu, their doggie is sick and I've got so much going on. Maybe next year.